For CS:GO players who want to buy some real life swag, rather than blowing hundreds of pounds on weapon skins, Valve finally have something for you. 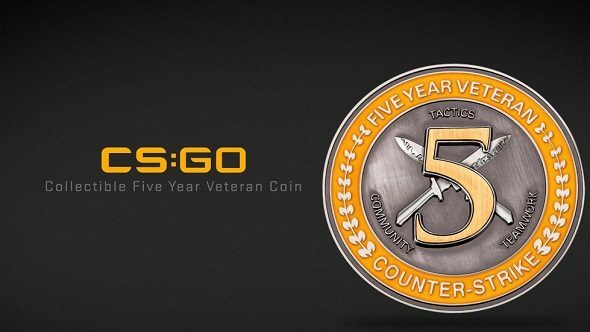 Players who have earned the Five Year Veteran coin in-game can now order an actual physical coin, to show off their years of service as a virtual counter-terrorism operative. Pad out your military record with these other great PC shooters. In order to order one of these coins, players must sign into the Valve Store with their Steam account which will then check to see if they have the coin in their inventory. If they meet the service requirements, veterans can then order the coin for $45, making it a significantly cheaper investment than a digital Flip Knife skin. You do need to have your account in good standing in order to purchase the coin, so VAC-banned accounts are out of luck. Worldwide shipping is free but people who order may be subject to import duty or VAT when their coin reaches them. Coins will begin shipping in mid-June and orders are available worldwide, except in Malaysia, Indonesia, Singapore, Philippines, Burma, Syria and Sudan. Besides the coin, veterans will also get a fancy wooden box, a stand and a box sleeve with the Five Year Veteran logo emblazoned on it. It’s certainly one of the nicer looking pieces of commemorative gaming merch that players can purchase, and may actually be worth some money in a few years’ time. Steam users can only buy one coin but don’t worry if you missed this initial phase – Valve are planning to manufacture more and make more purchasing options available as more players reach this milestone. Expect to see a Ten Year Veteran coin on the store once players finally make it to the decade mark.